When this Grandma was a child, Jello was a favored dessert. We had different flavors and ingredients put into different size Tupperware molds. My favorite was cherry Jello, with canned fruit cocktail in it. When I think of the calories and probably the lack of nutrition, I cringe. I fed my children Jello, mostly when they were very young. It seems there came a time when Jello just went out of vogue. Yes, family traditions trump. In our family, GG’s (great grandmother) Jello mold is on every family holiday menu for as long as I can remember. A holiday table would not be complete with the colorful Tupperware molded red Jello mold crowning it. I never asked GG for the recipe. Even at age 94, I believe she will live forever. So, after seeing the segment, I called her and got our family recipe for a delicious Jello mold to pass on to her grandchildren and great grandchildren. In a bowl dissolve the Jello into one cup of hot water. Add the cranberries and the mandarin oranges, including the liquid. Add the chopped walnuts. Use a Tupperware Jello mold. Put the mixture into the mold and refrigerate overnight. I wish I had known how easy this recipe was. It can be made with less calories by using sugar free Jello and canned fruit that has no sugar added. Jello. What is it anyway? 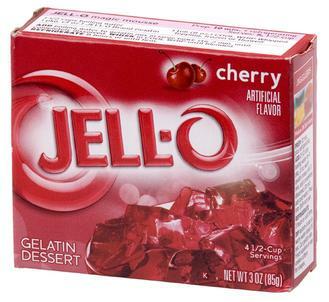 The term Jello is is a registered trademark of Kraft Foods for varieties of gelatin desserts, according to Wikipedia. Now I know why we capitalize the J in Jello. “Gelatin, a protein produced from collagen extracted from boiled bones, connective tissues, and other animal products, has been a component of food, particularly desserts, since the 15th century.” I wish I had known earlier. It does not sound appetizing now. I do not know if I am going to share what gelatin is with my grandchildren until after they learn to love it. As a child, I remember the ads and the slogan, “There’s always room for Jell-O.” Wikipedia confirmed that Jello went out of vogue beginning in the 1960’s to the early 1980’s, and Kraft is still trying to revive interest in Jello. Now, it seems, we all just have Jello for special occasions as a tradition passed on through our families for generations. Or, as stated on Wikipedia, it has recovered popularity for use in Jello shots! And Wikipedia even gives recipes for Jello shots. This Grandma is not interested in Jello shots and would like to stick to Jello molds for special occasions and special traditions. You can try GG’s delicious Jello mold or Dylan Dreyer’s mother’s recipe. Or, consider a red, white and blue Jello mold recipe for July 4th celebration coming up. You can start your own Jello mold tradition if your family does not already have one. And for more July 4th ideas, see a previous post: July Fourth Celebration For Grandchildren. And, yes, GG’s favorite Tupperware Jello Mold is still for sale on Amazon. So, unintentionally sounding like a cheerleader for Kraft, if there is not yet a Jello mold in your family’s tradition, it is time to introduce it. You can start your own Jello mold tradition beginning with July 4th if your family does not already have one. The recipes are easy to do with grandchildren as well as for grandchildren. After all, we remember our childhoods, can share our history while we share our Jello dessert with our grandchildren, who hopefully will share it with their grandchildren.